We are hearing about a number of VSAN stretched cluster implementations going on at the moment, which is great news. I just set up such a configuration once again in my lab as we look at some various scenarios for the next release of VSAN. Now, for anyone looking at implementing VSAN stretched cluster, there is the VSAN 6.1 stretched cluster guide which should be your first port of call. However I noticed that once VSAN stretched cluster is implemented, you get a few warnings that you typically wouldn’t see in standard VSAN deployments. That is what I want to call out here. This is a warning that you will see associated with the witness appliance. Because there is no VMFS or NFS datastores on the appliance (which is essentially a nested ESXi host), this warning is flagged. We do not support modifying the witness appliance in any way so adding a datastore would make the appliance unsupportable. However we are aware of the issue and we will have a resolution in a future release of VSAN. This is another warning you will see when VSAN stretched cluster is configured with VSAN 6.1/vSphere 6.0U1. This issue has also been resolved and a complete fix with appear in a future release of VSAN. [Update] In fact, it looks like this fix made it out with vSphere 6.0 U1b, which was released on January 7th, 2016. This is another issue that you might encounter. In my VSAN stretched cluster setup, the hosts on site A are on a different subnet to the hosts in site B. If this is the case, then you may face the same issue that I have seen above, which is that you get a health check warning. This is because that health check expects to find all hosts on the same L2 subnet (which was a requirement in earlier versions of VSAN). However VSAN is fully supported over L3, and this is especially true for stretched cluster implementations. This warning can be ignored if the subnet configuration shown in the lower part of the screen is expected. Hope this is of some help if you plan to deploy VSAN stretched cluster. Hi Cormac, i still got the witness out of cluster warning in U1b. I hope it’s gonna be fixed in U2? Ok, i believed it was vcenter related. 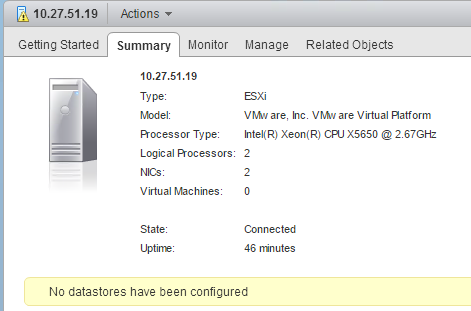 My ESXi are not U1b so i’ll update and let you know. I don’t find anything related to this error in the release notes BTW ? 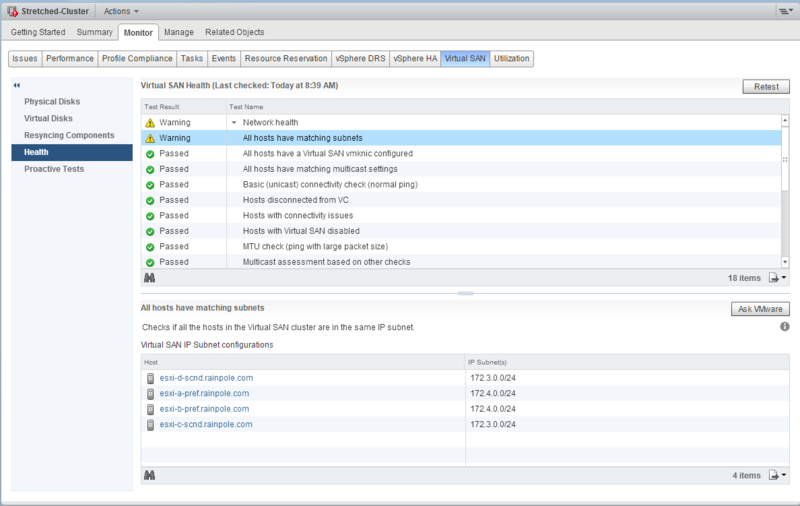 ESXi 6.0 U1b patch doest indeed correct the issue. Thanks for your insight Cormac! That was probably my fault as I provided the vCenter link in the post and not the Esxi one. Sorry about that, but the fix is in the ESXi code for sure. Let me know any ways.